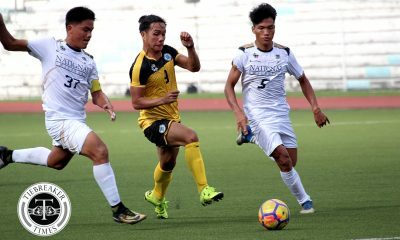 First half goals from Nico Macapal and Paolo Salenga proved to be sufficient for the NU Bulldogs to continue their winning ways as they picked up a 2-0 win against UE Red Warriors Sunday afternoon at the McKinley Hill Stadium. The victory is an important one for NU as they keep pace in the race for a place in the semifinals. Yet it was actually the Red Warriors who registered the first shot of the game when Mar Diano was left open. The UE rookie didn’t make the most out of it as he softly sent the ball towards Chris Perocho. NU then took their turn by creating two chances through set pieces, although neither of which posed serious threat. It took them 12 minutes to alert the Red Warriors. Paolo Salenga placed his shot on target, but it was tame enough for Clores to collect. Staying aggressive, the Bulldogs took the lead a minute later when Francis Jay Abalunan strung a neat pass towards Nico Macapal. With the goal in his sights, the forward struck from outside the box that went past Lendon Clores and into the net. Falling behind, UE tried to get themselves back. 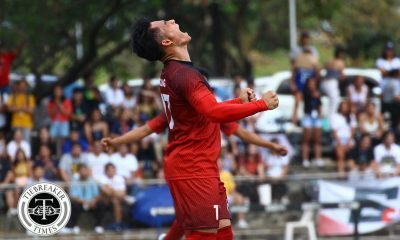 Mark Lerion slashed his shot wide at the 17th minute while Jasper Absalon prompted a routine save from Perocho three minutes afterwards. The trailing team have to rue those missed chances as NU didn’t give them plenty throughout the match. 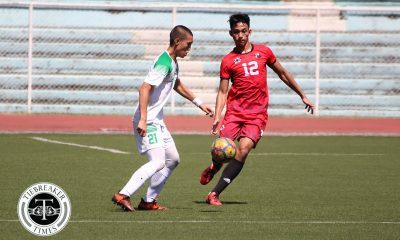 The Bulldogs went on to resume their dominance in the game, piling pressure on their opponents. Macapal was presented an opportunity to score his second but he didn’t put enough power to beat the UE goalkeeper. His teammate, Marole Bungay, had the power to his shot moments later but it lacked the accuracy needed to make it 2-0. Three minutes after the half hour mark, the first goal scorer tried from a similar spot where he found the back of the net. This time around, Clores stood firm to stop it. After absorbing the NU attacking barrage, UE got to send a shot past Perocho at the 36th minute mark through Lerion. He managed to head Absalon’s free kick into the net, but it was disallowed after he was deemed to have been offside. It was a tough break for the Red Warriors knowing that the complexion of the game would’ve changed had that counted. With their opponents nearly equalizing, NU actively sought for an insurance goal. Abalunan attempted to set up both Marole Bungay and Salenga but none of those found the back of the net. Their perseverance, nevertheless, paid off when Salenga got hold of the ball just outside the area. The league’s top scorer masterfully whipped the ball into the corner to double his team’s advantage. At the break, the Bulldogs were in command as they took a 2-0 lead. The second half was not as eventful as the first one but the Red Warriors showed determination to get themselves back in the game. 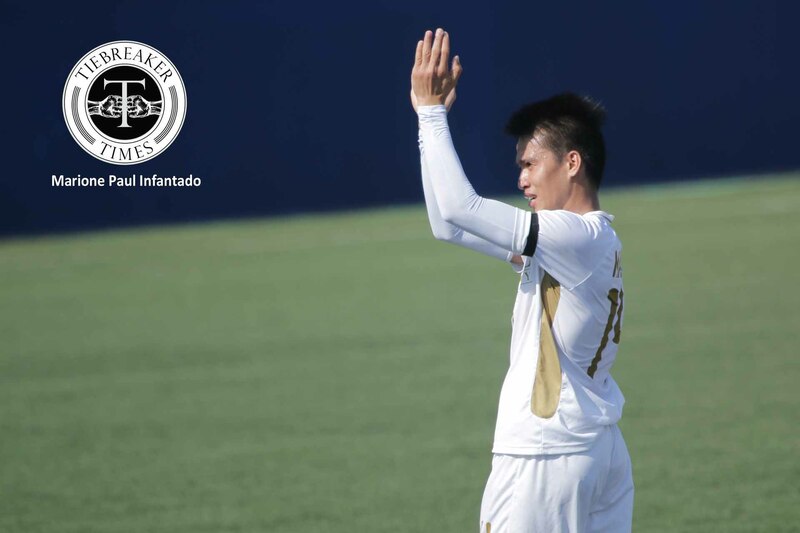 Louie Polinag tested Perocho with a long distance free kick. The NU keeper was actually in trouble for a second as he mishandled it, but he recovered in time to keep the ball safe. The boys in red looked like they were scoring the game’s third goal when Diano was offered space to shoot inside the box. Unfortunately for him, Perocho reacted well enough to maintain a shutout for the Bulldogs. At the hour mark, Regil Galaura was assisted by Lerion who threaded a through ball for him. Once again, Perocho was there to deal well with the danger. That proved to be UE’s last clear chance as NU bossed the proceedings until full time. Salenga was eager to add to his goalscoring tally in the season. After all, he leads all scorers with 10 goals already in the season. He had two good chances to make it 11, but the striker just couldn’t hit the target. It was the closest they could get in widening the gap, which only stayed at two come full time. NU Coach Wilhelm Laranas voiced slight satisfaction with his players’ performance. 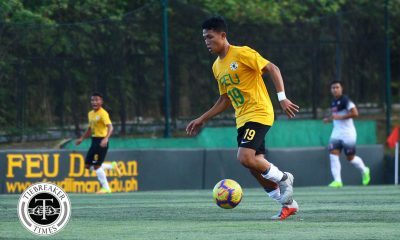 “We won pero ‘yung chances lang din ang kulang,” he observed, implying that they need more goals as it may come in handy in their bid for a final four place. The Bulldogs now have two wins in as many second round games, but they remain cautiously optimistic of their chances to make the playoffs. “Hindi pa kami kampante ngayon. Anything goes kasi dikit-dikit,” he expressed. Indeed, NU is in fourth place right now with 15 points, just three points behind league leaders UST while an Ateneo win in the later game will put six teams in a cramped chase for places in the playoffs. Laranas will hope to build on the win when they take on stuttering La Salle after the holy week break. As for UE, they remain at the bottom and will brace themselves for a match against UP at the end of the month.